Cut the foil into 8″ X 8″ squares. Make enough squares so that each team will have 3–4 to experiment with. Gather the pennies or washers, but make sure to use one or the other, not both. It is important that the weights all be consistent. If using washers, they should be 3/4″ or 5/8″ wide. Fill the bin or buckets with water, 6″–10″ deep. Ask your students if they have ever been on a boat before. What are boats made of? If wood and metal are on the list, ask your students if wood and metal always floats. Show them the pencil and paper clip and ask them what they think will happen if you put them in water. Drop them into one of the buckets or the bin of water and ask your students for their thoughts on what happened. Point out that while metal usually sinks, there must be something about metal boats that make them float, and that they will all experiment by making small metal boats today. Each team should pick a materials manager. Have the materials managers come to the front of the room and each take 1 piece of foil and 50 pennies or metal washers back to their teams. Remind teams of what the challenge is – to create a boat using just the piece of aluminum foil. 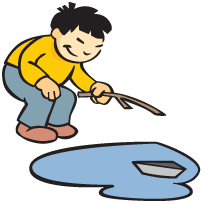 They will use their pennies or washers as weights to test their boats – when they are ready, they should bring their boat design to a bucket or bin of water, place the boat on the water and see if it floats. If it does, they can then add 1 weight at a time until their boat sinks. Make sure that each team is recording their progress by making drawings of their boat designs and writing down how much weight each design held. Students may build more than one boat if they would like, but have them focus on one design at a time. After 10 minutes or so, when each team has begun testing their first designs, gather your students together to talk about what they have discovered so far. What are some of the shapes they have tried? Have teams hold up their boats or draw the shapes on a chalkboard or piece of chart paper. How much weight (how many pennies or washers) did these different shapes hold? Do some shapes seem to work better than others? Make sure to also ask each team how they are putting the weight into their boat. Are they stacking the weights all in the middle or spreading the weights out? Does this make a difference? Send teams back to explore some more and try to make the strongest boat they can. Hand out more sheets of aluminum foil as needed. Near the end of the session, bring all the teams together again to share their conclusions. Try using smaller or larger squares of aluminum foil. Does having more or less material make a difference? Aluminum foil floats on its own, but different shapes will hold more weight than others. An even distribution of weight will also help a boat to hold more—stacking weight in the center of the boat is more likely to cause it to sink. After doing this activity, try the Float Your Boat – Clay Boats activity and see if kids can build a boat using a very different material.